World Cup themed beers are everywhere. 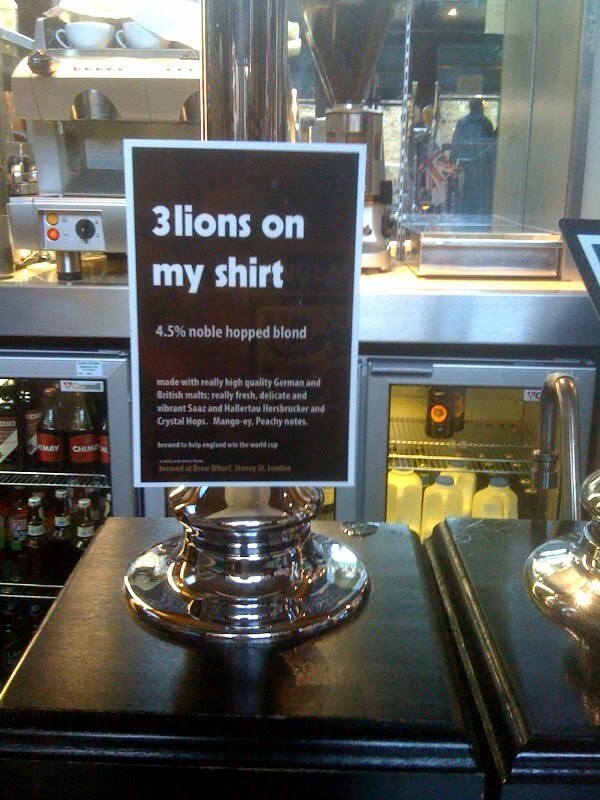 Saints & Sinners offer you “3 lions on my shirt”. A beer sold exclusively at the Brew Wharf brew pub in Borough Market and described as: “a 4.5% noble hopped blond - made with really high quality German and British malts; really fresh, delicate and vibrant Saaz, Hallertau Hersbrucker and Crystal hops”. I headed down with ten minutes spare and thought I’d check out the beer whilst Denmark edged out Cameroon 2-1. It’s straw-gold in colour with a rocky little head on top and a slight haze. The aroma bursts forth with tropical fruit; it’s like a mango and peach iced tea meets beer. On the palate it has sweetness at first and then bucket loads of those tropical fruits. It’s like a glass of chilled mango and peach juice with a spoonful of honey in it. Towards the finish there’s some biscuity grain and a slight piney, resinous edge to the hops. The critic in me says it could do with being a touch drier and with having a bolder bitterness in the finish. Towards the end of pint number one it was becoming a bit too sweet and I just felt it lacked that bitter sting in the tail. 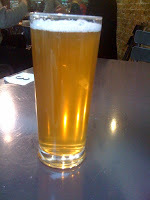 That aside, it's sweet, fruity, refreshing, a little bit different and totally delicious. Get down there and have a pint yourself, it's on as long as the World Cup is. Looking forward to this - I'm popping in on Thursday for a quick one of these and a Punjabi Wheat (or whatever it's called). Definitely worth a try! It's different but good, be interesting to see what you think. Slight haze? Looks cloudy to me. It does, but the picture doesn't represent what it was really like ... blame it on my crappy iPhone camera! I was sitting with a bright light behind me; it could've been down to that.